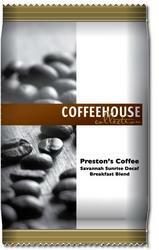 Preston's Coffee - Savannah Sunrise - Breakfast Blend DECAF. Small Batch Roasted with a simple blend of specialty grade beans. Roasted to bring out the earthy tones and quality.